Five o’clock syndrome describes the common condition experienced by contact lens wearers when their soft contact lenses become uncomfortable and dry towards the end of the day. Five o’clock syndrome is a condition that can be improved by proper selection of lens design and material. Do you know the urgent feeling at the end of the day when you just want to take your lenses out? Do you know the frustration when you have an important date after a long work day, but you just can’t stand your lenses anymore? Do you know the feeling while you are sitting at your computer that your lenses are slowing you down because of blurred vision? Based on these symptoms, your contact lenses may not match your lifestyle. You have only two options: either you change your lifestyle or you try contact lenses that will not dry on your eyes. Soft lenses are provided by many different manufacturers. Each major manufacturer makes its own soft lens polymer materials. Soft lens materials differ in the amount of water they contain and how well they hold the water they have. Contact lenses with the same water content but with different abilities to hold their water will not have the same comfort at the end of the day. Lens materials also vary in their accumulation of protein while being worn. Protein deposits on a lens can also significantly affect comfort. All soft contact lenses that are well fitted are initially comfortable. This is the primary reason people wear soft contact lenses rather than hard contact lenses. Beginning of the day comfort is the same for most soft lenses. The biggest complaint that soft lens users have is that their lenses become less comfortable towards the end of the day. The primary reason is that soft lenses lose their water or “dry out”. 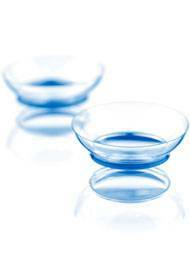 As soft lenses lose their water they become tighter and less “soft”. Therefore, activities and lifestyles that increase the loss of water from the lens will cause reduced wearing time. This is true of most but not all lenses. Lens materials that hold their water while being worn can retain their comfort in extreme environments and during activities that promote drying. If your lenses become more uncomfortable towards the end of the day or a few days before they need to be replaced, ask about the new water loving lenses at Vision Care Consultants.